Nail Polish Winter Wonderland, I love glitter. I've grown to love it more that I have discovered some wonderful Indie lines and the power of white felt and acetone. Now it's not such a chore to take off so I'm not intimidated to use it in most of my manicures. For this manicure I wanted to try the swoop design for just touch of glitter. 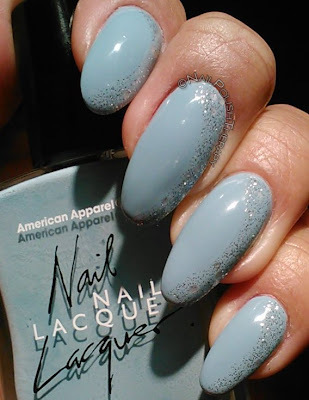 The blue I chose was from American Apparel American Denim and it's a really creamy sky blue. The glitter was from the OPI Ballet collection called Pirouette My Whistle. 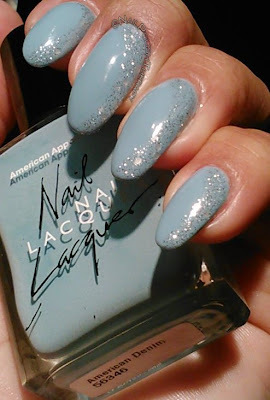 This glitter is so soft and subtle; when paired with a light color it adds the right amount of bling without taking away from the color. I think I will try this design with a different color combination that is more bold to see the effect. I enjoyed the glitter side and non-glitter side of the nail as well. It's a great way to enjoy two colors at the same time. What are your thoughts? Feelings? Concerns?